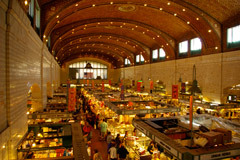 One of my best memories of Childhood is jumping into the family car and heading to the West Side Market for weekly grocery shopping and brats for lunch. Talk about a cultural mix of food, spices, meat, cheese, produce, anything you can imagine. The sights and smells whisk you away to a time forgotten. If you have not gone to the Market in a while, you need to. Open Monday and Wednesday 7-4pm and Friday and Saturday 7-6pm, this is truly one of Cleveland’s best resources and most unique attractions. Out of town guests of the weekend? This is a must see, its one of those things that really shows off our true colors as Clevelanders.